I Ride Park City had its world debut Tuesday, Aug. 26 at the bottom of Park City's town lift. It was a gathering of pros, bros, some hos, kids, parents, the rest of the snowboard community plus one drunken two stepping river dancer. I arrived to the screening area around 8p.m. with my friends Chris Swainston and Cody Comrie, aka Lil' Coco. We found a spot in the back and avoided the monotonous conversations about how the summer has been going and where we will be riding this season. If we had arrived a little earlier we could have stood in line and gotten some autographs from some of the Park City All-Stars – unfortunately we didn't. Saddened that we couldn't get our t-shirts signed by Shaun White, Drew Fuller, Heikki Sorsa, Erin Comstock, Scotty Arnold, Stevie Bell and some of the other pros we went to the back and drank our sadness away. Around 9:30p.m. the flick started, I had to stand on my chair to get a view. The opening shot was Shaun White slaying the half pipe. I Ride Park City is a film by Jim Mangan and features some of the world's top riders. There were some of the biggest boosts out of the pipe by Shaun White, creative and on point rail tricks from Stevie Bell and Aaron Bittner and one foot and no foot tricks by Heikki Sorsa. The filming and editing was amazing—Mangan was able to get helicopter shots, follow cams, pocket shots, poacher shots, sniper shots and about nine other angles of all the riders. The riding was impressive, but not innovative. I Ride Park City is a park video, so after about the tenth shot on the same jump it gets a little tiresome. 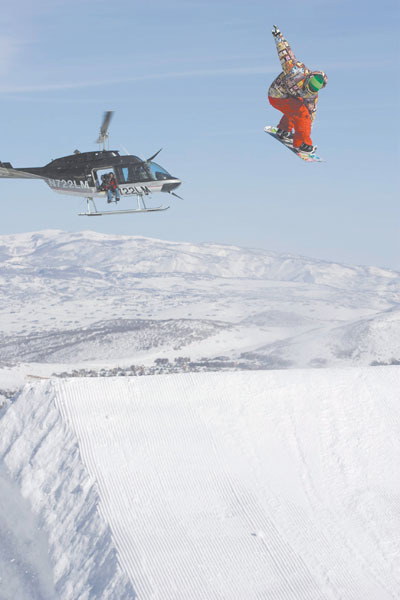 With the resources that Park City has, I wished they would have been a bit more creative with their jump set up. There were some interesting set ups in the movie, but nothing that I haven't seen before. I really liked the quarter pipe transfer set up and the jump over the cabin, but I feel that there could have been more. There were a few 'pow' shots, but we all know Park City is not known for their amazing backcountry. Ultimately, I Ride Park City is a great park video, but it just wasn't unique.